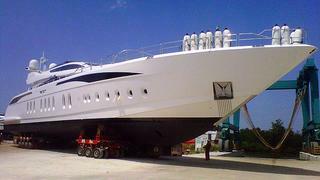 Leopard Yachts announces the launch of Tutto le Marrane, the third hull of their Leopard 46m series. Tutto le Marrane is a 46.20m motor yacht with a naval architecture and exterior styling by the Studio Bacigalupo. The interior is designed by Cristiano Gatto, accommodating to 10 guests in a master suite, two double and two twin cabins. The atypical position of the master suite on this series gives the feeling she's on the main deck, positioned forward, and seperated from the large saloon by a media room and the wheelhouse. Demonstrating performance and comfort, the Leopard 46m is powered by twin 1,790kW MTU engines and a central MTU booster of 3,440kW, all three coupled to KaMeWa waterjets. The resulting speed is impressive at 35 knots and a range of 700 nautical miles. Tutto le Marrane will make her debut at the Festival de la Plaisance in Cannes next September.